There's been a lot of talk in recent times, about omega 3 fatty acids. Though there's some hype created around foods containing this essential fatty acid and some foods that are fortified with omega 3 fats, this type of fat is really important for our health and can be obtained only thru foods. Omega 3 fats are useful for normal growth in children. Several benefits have been suggested by studies on adults as well. Regular intake in it's natural form can support cardiovascular health, immune function and brain health. In excess, omega 3 fats can cause harm, so stay away from supplements unless they are absolutely needed. Rich food sources of omega 3 are fish, flaxseed, hempseed and walnut. These fats are also found in smaller quantities in spinach, rajma, urad dal, hazelnut, oils, eggs, etc. 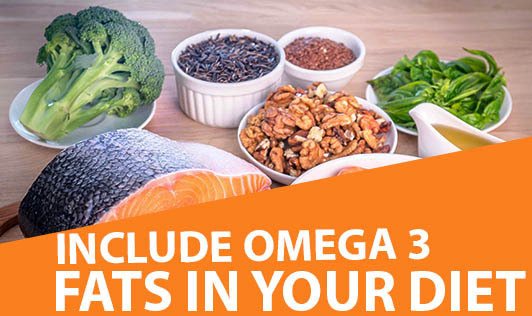 Include omega 3 fats in your meals regularly.